Focussing on professional development of academic staff as higher education practitioners, this paper reports on the relationship between ICTs and teaching and learning in higher education, and on the way that that relationship plays out in a formal staff development course offered at Rhodes University, South Africa. The Technological Pedagogical Content Knowledge (TPCK) framework developed by Mishra and Koehler (2006) is used as a theoretical lens for demonstrating the undesirability of an unnatural separation of ICTs from teaching and learning in dominant discourses within institutional and national environments. The paper concludes by highlighting some implications of the TPCK framework for staff developers and curriculum design in higher education. Key words: information and communications technology (ICT); learning technologies; professional development; academic development; educational development; curriculum design. Internationally the way in which higher education (HE) is conceptualised is changing. Globalisation, massification, shrinking resources, the proliferation of information and communication technologies (ICTs), increased demands for quality assurance and greater public accountability, and increasing competition among higher education institutions have all contributed towards changing the traditional role of academics. Academics now operate in what Barnett (2000) terms “a world of supercomplexity”, where the very frameworks on which their professions are based are continuously in a state of flux. Technological and economic changes, for example, have resulted in a reorganisation of time and space (Giddens 1984, cited in Unwin 2007). Furthermore, the supercomplexity and uncertainty of the postmodern world have caused people to be more reflexive, which, in turn, has led to a heightened sense of ontological insecurity for academics (ibid). This changing context of higher education (HE) both internationally and in South Africa presents new challenges for lecturers. In particular, the expansion of the application of technology in teaching and learning has been one of the most ubiquitous major recent changes in higher education (D’Andrea and Gosling 2005). On the one hand the use of ICTs is presented as a solution to many of the teaching and learning challenges brought about by the new HE landscape, while, on the other hand, starting to use ICTs in their teaching and their students’ learning often represents an almost insurmountable obstacle to lecturers. Some of the ways in which higher education institutions have responded to the challenge of implementing ICTs in teaching and learning include developing coherent institutional strategies to change (see for example, McNaught and Kennedy, 2000 and Salmon, 2005), focussing on the impact of learning technologies (Beetham et al., 2001, Timmis, 2003 in Conole, White and Oliver, 2007) and the offering of models for representing and understanding organisational contexts and change management (Morgan, 1986 and Mumford, 2003 in Conole, White and Oliver, 2007). Yet another strategy employed by higher education institutions in response to such challenges and which this study reports on, focuses on support and staff development issues (Smith and Oliver, 2000; Oliver and Dempster, 2003 in Conole, White and Oliver, 2007), placing greater emphasis on the professionalisation of academic staff as teachers and assessors. Staff development units are tasked with contributing to the professional development of academic staff in HE through professional development workshops and courses leading to formal qualifications. Through these initiatives Academic Development (AD) staff need to find ways of not only helping academics cope with these changes, but also of assisting them in developing appropriate strategies for preparing their students to operate successfully in a world of “supercomplexity”. With regard to the use of ICTs in teaching and learning, however, a major problem is that staff developers themselves are often ill-equipped for using ICTs in their own teaching and courses, let alone for assisting academic staff to follow suit. These professional communities have allowed a sense of belonging and confidence in shared decision-making when (often) external factors seemed to be working against us … (in Unwin 2007, 296). In an environment which is not always supportive of change, Academic Development (AD) staff are challenged to design workable strategies in formal professional development courses for promoting effective practice in teaching with technology. Investigating the relationship between ICTs and teaching and learning in higher education, this paper uses the Technological Pedagogical Content Knowledge (TPCK) framework developed by Mishra and Koehler (2006) as a theoretical lens for reporting on the practice in a staff development course for academics at Rhodes University, South Africa. Many have regarded ICTs as the solution to a range of educational problems. In South Africa, much of the discourse on using ICTs in HE teaching and learning, however, seems to focus on access to technology; that is, on the availability of computers, the Internet and bandwidth rather than on the way ICTs are being used in support of teaching and learning. In many contexts this focus on access has resulted in pedagogically poor applications of technology where ICTs are only used in transmission modes of teaching and learning. Following some spectacular failings of eLearning projects globally, (see, for example, Latchem, 2005) there now seems to be a growing concern about the application of those technologies in teaching and learning to investigate how they can and are being used to support teaching and learning (see for example, Czerniewicz and Brown, 2006). In addition, there has been a growing recognition that technology used in the absence of a sound theoretical framework or pedagogy is generally not very effective in reaching programme goals. Laurillard (2002); Mishra and Koehler (2006) and Unwin (2007), for example, have cautioned against the use of ICTs without a conceptual framework or without a clear understanding of why and how the ICT will contribute to students’ learning. These insights have led some higher education institutions (HEIs) to realise that pedagogically sound integration of ICTs in lecturers’ teaching requires more than technical support; it also needs professional development for lecturers to use ICTs in their teaching and learning. There seems to be a wide variation in how HE practitioners conceptualise the integration of information and communication technologies (ICTs) in teaching and learning. This implies a question concerning our understanding of learning with ICTs and the implications for the professional development of academic staff. Following Shephard (2004), we use the concept of ICTs in teaching and learning to broadly include computer-based and online tools and resources used to support student learning, but we also focus on the interactive use of those tools to facilitate interpersonal communication and collaboration. At Rhodes University, however, many of the discourses on the role of ICTs in teaching and learning seem to conceptualise the use of computers in isolation from lecturers’ teaching practice. Users of one such dominant discourse, for example, believe that the use of ICTs only add value to those students who are under-prepared for higher education studies. Such students should therefore be sent to a computer laboratory to work through a computer-based tutorial or other courseware product on a particular topic. This thinking is in line with a model of computer-based education that emphasises learning as the transmission of content over the construction of knowledge and seems to be loosely based on behaviourist theories of learning, even though their designers might profess constructivism as the underlying theory of learning (Thorpe, 2002). In this model, students “learn” or supposedly “construct their own knowledge” by working, often sequentially, through courseware lessons such as computer-based “tutorials”, drill and practice programs, simulations, tests and games (Alessi and Trollip, 1991). Given the way in which ICTs are dealt with in isolation from teaching and learning in official documentation pertaining to teaching and learning, this separation of ICT-use from other teaching and learning endeavours in South African Higher Education comes as no surprise. The same division is, for example, reflected in the Higher Education Quality Committee’s (HEQC) Improving Teaching and Learning (ITL) Resources (2005). Developed during 2003 in a series of workshops the ITL Resources was a collaborative project between the HEQC and academics in private and public higher education institutions in South Africa and other countries. Aimed at quality promotion and capacity development these resources contain suggested good practice descriptors that are consequently used as the basis for the institutional audits conducted at various South African higher education institutions. … technology has revolutionised teaching and learning; and academic staff members now face the challenge of introducing effective ways of engaging technology for learning (HEQC 2005, 140). Furthermore, in the unit standards for the PGCHET itself, the use of ICTs in teaching and learning is dealt with in isolation from other core modules such as curriculum development, assessment, evaluation and learning design. While the unit standard for the elective module mentioned above, Design and develop web-based learning, specifically focuses on the use of ICTs in teaching and learning, none of the other seven compulsory core unit standards or four elective unit standards addresses the issue of using ICTs in support of teaching and learning. We believe that this separation of the use of technology from other teaching and learning topics severely limits the potential of ICTs to enhance teaching and learning. Fortunately, due to the widespread use of the Web and the increasing pervasiveness of ICTs as experienced by university educators and students, the practice of isolating educational technologies is increasingly being challenged in favour of practices based on social constructivist learning theories that, for example, emphasise interpersonal interactivity over interaction between a student and a courseware program. Consequently, computers are assuming a more central role in mainstream teaching and learning. This shifts the location of learning beyond the confined spaces of “the lecture” and student computer laboratories with limited “opening hours” towards learning anytime and anywhere, with profound implications for the everyday practices of teaching, learning, research, administration and recreation. Since “there is no single technological solution that applies for every teacher, every course, or every view of teaching” (Mishra and Koehler 2006, 1029), the appropriate and pedagogically accountable integration of ICTs into teaching and learning, however, presents many challenges which have to be addressed in professional development courses. Due to the relative newness of the field as well as the increasing pace of technological change, much of the work being done in relation to the use of ICTs in teaching and learning can be described as exploratory and thus is often implemented in the absence of well developed theoretical frameworks (Unwin, 2007). Practice that develops slowly and theory hardly at all (Laurillard, 2002) severely limits the potential of ICTs to enhance teaching and learning. It is therefore unsurprising that ongoing debate seems to characterise discussions about the most appropriate way of supporting academic staff in using ICTs in their teaching and in their students’ learning. Shephard (2004, 67), for example, distinguishes between the provision of technological support to describe an orientation of “let us help you to develop and use these learning resources” and professional development to signify the scaffolding provided to lecturers to help them develop the theoretical understandings and skills that they will need “to find, develop, and use these learning resources” in ways which contribute to the kind of learning that is valued in higher education.These different orientations to assisting academic staff to integrate ICTs in their teaching and learning have very specific implications for educational technologists and academic development practitioners alike. With regard to the support model, the term “instructional designer” is often used to describe the role of educational technologists. In supporting staff (“let us help you to develop and use these learning resources”), both an instructional designer and a lecturer (as content expert) would often be part of a courseware development team which might include one or more of the following: a project manager, a graphics or web designer, a programmer, a web developer, etc. Instructional designers would therefore engage in specific projects (e.g. developing a piece of courseware), with target and sign-off dates, often following well-established software development models such as the modified ADDIE model as described by Kruse and Keil (2000). In a professional development context, however, educational technologists increasingly fulfil the role of “curriculum designer” alongside one or more academic staff members in a curriculum development team (Littlejohn and Peacock, 2003). In this context, educational technologists are more likely to play the role of “curriculum designers” (rather than that of instructional designers), resembling the function of academic development practitioners more closely. Here emphasis moves away from specific ICT-based interventions (for example as in the case of developing a piece of courseware) to a series of consultations over a longer period of time, in a whole module or course that is presented over anything from a few weeks to an entire academic year. Lecturers starting to use a learning management system usually make small incremental changes to their courses and teaching as they adopt various tools or features of a learning management system (LMS) over a period of time. In this process they would be assisted by an educational technologist (acting as a “curriculum designer”) who would work alongside them to negotiate the pedagogical implications of various options of using ICTs (Oliver, 2002). … the historic constancy of lecturing methods on campus may make it hard for faculty to imagine strategies that take them outside an intuitive core of shared assumptions and beliefs about teaching methods (Daniel 1996, 137). The combination of increased use of LMSs in higher education, inflexible course structures, time tables and the dominance of the “performance” model of teaching (Morrow, 2007) therefore seem to have shifted the role of educational technologist from “instructional designer” to “curriculum designer”. After outlining the context and some of the challenges involved in the integration of ICTs within a Postgraduate Diploma in Higher Education (PGDHE) course we will use Mishra and Koehler’s (2006) Technological Pedagogical Content Knowledge Model as a lens through which to view our own practice. Since 2000 Academic Development (AD) staff members at Rhodes University in South Africa have offered a Postgraduate Diploma in Higher Education (PGDHE) aimed at professionalising the practice of academic staff in the Institution. Although the curriculum for the PGDHE was developed by a team of AD practitioners, the team did not initially include an educational technologist. At the time the application of information and communication technologies (ICTs) to teaching and learning was addressed in the PGDHE through stand-alone presentations by an educational technologist. These stand-alone presentations did however not seem to lead to either successful learning about ICTs in teaching and learning, or to significant implementation of ICTs in participants’ teaching and courses. According to Mishra and Koehler (2006) this de-contextualised practice is indicative of the knowledge structures that underlie much of the current discourse on educational technology that separates technology from pedagogy and content. The introduction of a learning management system into the PGDHE in 2005 resulted in closer collaboration between the AD practitioners teaching on the programme and the educational technologist in the department. This has led to the formation of a “professional learning community” (Unwin 2007, 295) comprising the AD staff and the educational technologist, which has enabled an “integrated pedagogic approach to ICTs”. Since ICTs are now used to support participants’ learning in the PGDHE, the use of ICTs to enhance teaching and learning in Higher Education is modelled for participants to use in their own teaching. The curriculum for the PGDHE offered at Rhodes University is based on the South African unit standards for the PGDHET, the competency-based national qualification for lecturers in HE mentioned earlier. Since the curriculum development team adapted the unit standards into a modular format, the curriculum for the PGDHE displays a higher level of theoretical coherence than is usually associated with unit standard-based programmes. Based on the curriculum development team’s shared theoretical and philosophical beliefs about what constitutes an appropriate approach to the development of academic staff in higher education, the practice-based, two-year course was designed to meet the specific needs of lecturers within the context of their disciplines, the university, and the higher education context, nationally and internationally. The stated purpose of the course is to encourage the professional development of lecturers by assisting them to enhance their ability to facilitate, manage, and assess their students’ learning, to evaluate their own practice effectively, to develop their knowledge of higher education as a field of study, and to provide professional accreditation (Postgraduate Diploma in Higher Education Course Guide, 2006). The programme is offered in the form of four core modules (Learning and Teaching in Higher Education; Curriculum Development; Assessment and Moderation of Student Learning and Evaluation of Teaching and Courses) and one elective module. Despite the positive evaluations on the programme as a whole (see Quinn, 2003; 2006), the curriculum development team has always felt that the add-on workshops on technology, although offered as part of specific modules, were not successfully encouraging participants to use technology to enhance their teaching and their students’ learning. This perception was borne out by our analysis of participants’ teaching portfolios, the primary method of summative assessment in the programme, which contained little evidence of their using ICTs in their teaching, and from feedback we elicited from them. At our institution the close relationship between ICTs and teaching and learning has been recognised in that the position of the educational technologist is based in the unit that is mandated to develop teaching and learning, rather than in, for example, the division that is tasked to provide ICT infrastructure and services to the institution. While the academic development staff members have always recognised the importance of integrating ICTs into teaching and learning, we were less certain about the most appropriate way in which it could be integrated. Consequently, ICTs in teaching and learning were initially treated as an “add-on” rather than central to teaching and learning. This was also evident in the development of the Postgraduate Diploma in Higher Education (PGDHE). Based on national unit standards this programme made provision for the “teaching” of ICTs in teaching and learning through an elective module worth 10 credits (initially called “Design and develop web-based learning”) and one 90-minute session in each of the “Learning and Teaching in Higher Education” and “Assessment and Moderation of Student Learning” modules. While the elective, now called “ICTs in Teaching and Learning”, provided PGDHE participants with the space to investigate and report on an ICT-related intervention, take-up of this elective was very low with only approximately 17% of participants taking this elective over a 5-year period. Following several years of experimenting with various web-based learning management systems (LMSs), the institution adopted Moodle in 2004. While the LMS initially had very little impact on the way that the PGDHE was taught, the facilitators of the programme started using the LMS as a repository for resources (in 2005), but later also more interactively by requiring PGDHE participants to reflect on their learning in online journals (in 2006) and in participating in online discussion forums (in 2007). The primary aim of integrating ICTs into the PGDHE was to expose participants to the potential of ICTs to enhance their teaching and their students’ learning by modelling the use of ICTs. This is particularly significant as very few, if any, of the PGDHE participants had any previous experience of being taught using ICTs. While we do not claim that this integrated model of imbedding ICTs into the curriculum was solely responsible for the increasing uptake of the LMS amongst PGDHE participants for their own courses, we will assert that it is a more pedagogically sound approach than the earlier practice of de-contextualised, add-on presentations in two of the modules as described above. The need to have conceptual lenses through which to explore research data has been thoroughly argued (see for example, Mishra and Koehler, 2006 and Oliver, 2003). Such theoretical lenses allow researchers (and practitioners) to make inferences about the world. May goes so far as to claim that the findings of social researchers are meaningless unless they are situated in a theoretical framework which must be made explicit: the “facts do not speak for themselves” (2001, 30). Furthermore he argues that social theory and concepts are necessary both for interpreting empirical data, but also as a basis for critical reflection on the research process, and social life and social systems in general. The main aim of our research was to use the available theory to help us begin to uncover the mechanisms and processes at work in our context. TPCK represents a class of knowledge that is central to teachers’ work with technology. This knowledge would not typically be held by technologically proficient subject matter experts, or by technologist who know a little of the subject or of pedagogy, or by teachers who know little of that subject or about technology (ibid, 1029). a conceptually based theoretical framework about the relationship between technology and teaching can transform the conceptualisation and the practice of teacher education, teacher training, and teachers’ professional development (ibid, 1019). As explained above, much of the earlier theorising about the use of technology in education involved viewing technology as being separate from both content and pedagogy. A number of scholars have pointed to the failings of traditional add-on methods for teaching the use of technology. Mishra and Koehler, for example, regard these methods as “ill suited to produce the ‘deep understanding’ that can assist teachers in becoming intelligent users of technology for pedagogy …” (ibid, 1032) and suggest that it is necessary to integrate the use of educational technology with sound pedagogy and that doing this requires the development of “a complex situated form of knowledge that [they] call Technological Pedagogical Content Knowledge (TPCK)” (ibid, p. 1017). 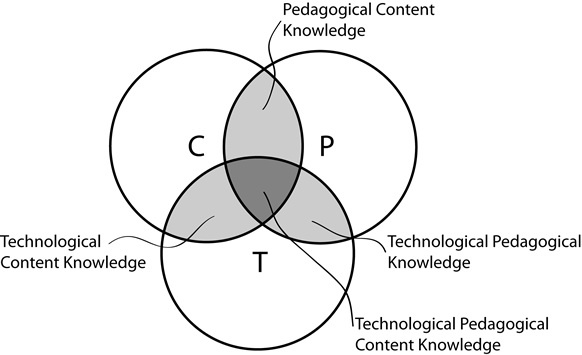 TPCK emphasises “the connections, interactions, affordances, and constraints between and among content, pedagogy, and technology” (ibid, 1025). Content knowledge. In the context of a professional development course which is made up of lecturers from a range of disciplines it is safe to assume that they have or are able to acquire the disciplinary knowledge they require for teaching. In such a cross-disciplinary course for lecturers it is therefore neither practical nor necessary to teach “content knowledge”. Participants should however be encouraged to critically examine their disciplines; to think about issues such as what counts as knowledge in their disciplinary areas, and so on (see for example Quinn and Vorster, 2004). Pedagogical knowledge. Mishra and Koehler define pedagogical knowledge as “deep knowledge about the processes and practices or methods of teaching and learning and how it encompasses, among other things, overall educational purposes, values and aims” (ibid, 1026). This kind of knowledge is the focus of a professional development course for lecturers in higher education. In addition, another purpose of such a programme is to encourage participants not just to develop their disciplinary identities (e.g. lawyer, historian, geologist), but also to develop their identities as teachers in HE. For this to happen, participants need to be exposed to current theories of teaching and learning generally and those applicable specifically to HE contexts. Pedagogical content knowledge is knowledge linked to the teaching of a specific discipline. PCK explores, for example, the difference between teaching history and teaching chemistry or drama. It requires knowledge of which curricula and teaching and assessment methods are most likely to achieve the learning outcomes of specific disciplines and courses. According to Mishra and Koehler, PCK “is concerned with the representation and formulation of concepts, pedagogical techniques, knowledge of what makes concepts difficult or easy to learn, knowledge of students’ prior knowledge, and theories of epistemology” (ibid, 1027). Pedagogical content knowledge also includes the ability for disciplinary experts to make explicit the academic literacies of their disciplines (Boughey, 2002) to enable students to understand not only what counts as knowledge in their disciplines but also how to express that knowledge. In the context of a cross-disciplinary professional development course such as the PGDHE, much of this cannot be explicitly taught but participants can be asked critical questions which encourage them to transfer generic pedagogical knowledge and apply it to the teaching of their specific disciplines. Technology knowledge. We would like to believe that lecturers in higher education should come with some basic level of computer literacy skills. They should, for example, be able to work with computers, networks, the Internet and understand operating systems, computer filing systems and so on, in the same way that they are able to work with books, pens, and overhead projectors, for example. We are aware, however, that this picture does not reflect the current reality at Rhodes University. Since all seven parts of TPCK are necessarily integrated and should not be viewed in isolation, participants’ potential lack of basic computer literacy skills might jeopardise their development of TPCK. Since we do not see the development of basic computer literacy skills as core to our function, these literacies are being addressed by the Human Resources Division. Within the PGDHE course, such skills are therefore only addressed on an ad-hoc, just-in-time basis when required. Technological content knowledge is “knowledge about the manner in which technology and content are reciprocally related” (ibid, 1028). Again, in the model which we propose for professional development, TCK is not explicitly taught, but it is modelled through the use of technologies to teach the programme. Due to the practice-based nature of the PDGHE, participants are encouraged to reflect on how technology is used and to think about how they could apply it in their contexts. Technological pedagogical knowledge is made up of generic knowledge regarding how technology can be used for general pedagogic aims. While TPK is not directly addressed in the PGDHE, the educational technologist offers hands-on workshops which focus on the potential of technology to support teaching and learning in general and aim to develop participants’ TPK. quality teaching requires developing a nuanced understanding of the complex relationships between technology, content and pedagogy, and using this understanding to develop appropriate context-specific strategies and representations (ibid, 1029). In their framework, and in the way in we theorise our practice, separating the components is only for the purposes of analysis. In reality all seven are necessarily integrated and should not be viewed in isolation from one another; they exist in dynamic tension. It is obvious then that content neutral, add-on generic courses or workshops to train lecturers to use ICTs in teaching and learning, while they have a valid place and purpose, are unlikely to lead to integrated knowledge which will enable lecturers to take full advantage of the potential of educational technologies to enhance their teaching. TPCK is more likely to help academic staff to develop the kinds of curricula, teaching and assessment methodologies that will ensure that their students engage in the kind of learning appropriate for their context. Mishra and Koehler found that the TPCK framework helped them to articulate “a clear approach to teaching (learning technology by design), but also served as an analytical lens for studying the development of teacher knowledge about educational technology” (1041). Their framework has enhanced our understanding of the practices which we are implementing intuitively. Using the framework enabled us to analyse evaluation data and to critically reflect on the relationship between content, pedagogy and technology and on how we were developing the range of different knowledges in our programme. It enabled the “development of deeper understandings of the complex web of relationships between content, pedagogy, and technology, and the contexts in which they function” (ibid, 1043). Assisting us in building metacognitive understandings of our practices, the TPCK model will in future enable us to consciously integrate the development of TPCK in a more deliberate and theorised way. Our analysis of course evaluations and our own critical reflections show that we as educational developers and other lecturers as participants on the PGDHE, have made shifts towards developing TPCK, that is, a more nuanced understanding of the relationships between the three types of knowledge and how to develop TPCK in a way which is commensurate with the aims, purposes, underpinning philosophy and outcomes of the PGDHE. Lecturers who attended our professional development programme in 2007 are beginning to acquire the appropriate knowledge which will enable them to use ICTs in their own teaching in ways which will lead to the kind of learning valued in higher education. The journals have been a very useful way to record my thoughts about the learning tasks … it’s been a very good way of receiving comments back from my course facilitator. I think this system works very well, and it’s a very convenient way of exchanging information, and then storing it in one place. … The journals are also a ‘safe’ space to record your thoughts when you’re not necessarily on top of the material yet – it is then very useful for reflective purposes to go back later and see how your own views and understandings have changed. I found the … journal entries to show progression in my thinking and allow me to ‘build’ a piece of work. Forum discussions have been really great – as we can easily share our thoughts at a convenient time and refer back to what has been said. ... using Moodle in the course has made me aware of its potential in my teaching – this has been the best way of demonstrating it to us. I have become so aware of it [need to integrate ICTs in teaching and learning] that I have made it my elective to investigate the potential to use it at my college. … how I am currently using Moodle is that it is a resource site at the moment, but it is an interactive resource site … I’ve sectioned off stuff so as to lead people gently into what its all about and then added the use of the calendar tool, where I keep updates on all sorts of useful information …it’s really cool. I’ll be ready next year. If, according to Mishra and Koehler (2006) educators have to develop or maintain these seven sets of knowledge bases, what are the implications for academic development staff who are tasked with the professional development of these educators? Which sets of knowledge bases should they possess or develop for themselves? As discussed earlier, due to the specificity of content knowledge in various disciplinary contexts, it is neither feasible nor desirable for academic development staff to be responsible for lecturers acquiring any of the Content Knowledge, Technological Content Knowledge, Pedagogical Content Knowledge or Technological Pedagogical Content Knowledge for any disciplines other than in the disciplinary area of Education and related fields (e.g. Psychology, Adult Education, etc. ), which is already represented as Pedagogical Knowledge in the TPCK model. While educational developers would normally, by virtue of the field they are working in, have already acquired Pedagogical Knowledge, the possibility of them having developed Technological Knowledge and Technological Pedagogical Knowledge is rather slim. This is often because they too, have not experienced being taught with digital technologies, but primarily because the structures in which educational technology operate frequently perpetuate the undesirable split between the development of teaching and learning on the one hand and the use of ICTs in teaching and learning on the other. Assuming that staff developers have already developed their Pedagogical Knowledge, they would be required also to develop their Technological Knowledge as well as their Technological Pedagogical Knowledge so as to enable them to become comfortable in advising lecturers on the potential role of ICTs in their teaching and curricula and thus maintaining their professional status and credibility as staff developers. Educational Technology will consequently have to be perceived as less focused on technology and more orientated towards effective teaching and learning. Working in teams which include an educational technologist seems to be one way in which academic staff developers can begin to gain the other types of knowledge that will enable them to help their “students” develop TPCK. In line with the ideas of many academic development practitioners (see, for example, Toohey, 1999; Mishra and Koehler, 2006; Unwin, 2007) we would like to argue for curriculum development to be a team-based activity. Although this is certainly not a new idea, like many campus-based institutions, lecturers in most departments at Rhodes University work in isolation from their colleagues when developing their courses, resulting in academic processes at this institution still resembling a cottage industry where all the major teaching and assessment processes are managed and executed by a single individual (Daniel, 1997). In cases where curricula are indeed designed by teams of colleagues, the absence of an educational technologist (or “technology enthusiast”) may perpetuate the perceived divide between teaching and learning on the one hand, and technology on the other. It might therefore be worthwhile to promote the idea that the curriculum design team should also include an educational technologist (or enthusiast) and other specialists, for example an information science specialist from the University Library. Rather than acting primarily as an “instructional designer” as described earlier, educational technologists have a role to play in identifying areas of teaching, learning, assessment and evaluation that might benefit from the use of ICTs and in assisting lecturers to use ICTs in pedagogically sound ways. “Practitioners require support in moving from individual development of learning resources and courses towards team-based collaborative development and re-use within learning communities” (Littlejohn et al., 2007, 144). The ICT enthusiast “will be there to mediate … the potential of the technologies with the desired pedagogies. … they will be able to reduce anxieties and allow the development of confidence within the learning community with the technologies being used” (Unwin 2007, 302). In this paper we described the establishment of a professional learning community within an academic development unit, the purposes of which were to address both the lack of knowledge and experience of the AD staff with regard to using ICTs in teaching and learning, as well as to model the various ways in which lectures can integrate ICTs into the teaching and learning of their disciplines. Through using technology to teach our course and through forming the professional learning community we have tried to provide a professional development experience for lecturers that might help them to develop the kind of nuanced understandings called for in Mishra and Koehler’s TPCK framework (2006). 1.See also Shephard (2004) on the need for team-based approaches to curriculum development in higher education. 3.As Mishra and Koehler (2006, 1026-7) acknowledge, these ideas are not new. They cite, for example, Keating and Evans, 2001; Zhao, 2003, Hughes, 2005 and Neiss, 2005 who have argued similarly. Alessi, S.M. and Trollip, S.R. 1991. Computer-Based Instruction: Methods and Development. Second Edition. Englewood Cliffs, New Jersey: Prentice Hall. Barnett, R. 2000. Realizing the university in an age of supercomplexity. Buckingham: Society for Research into Higher Education and Open University Press. Beetham, H., Jones, S., & Gornall, L. (2001). Career Development of Learning Technology Staff: Scoping Study Final Report. JISC Committee for Awareness, Liaison and Training Programme, http://sh.plym. ac.uk/eds/effects/jcalt-project. Boughey, C. 2002. “Naming' Students' Problems: an analysis of language-related discourses at a South African university”. Teaching in Higher Education, Vol. 7, No. 3, pp. 295-307. Conole, G., White, S., & Oliver, M. (2007). The impact of e-learning on organisational roles and structures. In G. Conole and M. Oliver. Contemporary Perspectives in E-learning Research. Routledge. Czerniewicz, L. and Brown, C. (2006). The virtual M�bius strip: Access to and use of Information and Communication Technologies (ICTs) in higher education in the Western Cape. Cape Town: Centre for Educational Technology. Daniel, J.S. 1996. Mega-Universities and Knowledge Media: Technology Solutions for Higher Education. London: Kogan Page. Daniel, J.S. 1997. “Why Universities Need Technology Strategies”. Change. July/August, 11-17. D’Andrea, V. and Gosling, D. 2005. Improving Teaching and Learning in Higher Education. A whole institution approach. Berkshire: Open University Press. HEQC. 2005. Improving Teaching and Learning Resource. Council on Higher Education. Hughes, J. 2005. The role of teacher knowledge and learning experiences in forming technology-integrated pedagogy. Journal of Technology and Teacher Education, Vol. 13. No. 2. pp. 277-302. Keating, T. and Evans, E. 2001. Three computers in the back of the classroom: Pre-service teachers’ conceptions of technology integration. Paper presented at the annual meeting of the American Educational Research Association, Seattle, WA. Knight, T. and Trowler P. 2001. Departmental Leadership in Higher Education. Buckingham: Society for Research into Higher Education and Open University Press. Kruse, K. and Keil, J. 2000 Technology-Based Training. The Art and Science of Design, Development, and Delivery. San Francisco: Jossey-Bass/Pfeiffer. Latchem, C. 2005. “Failure – the key to understanding success”. British Journal of Educational Technology, Vol. 36, No. 4, pp. 665-667. Laurillard, D. 2002. Rethinking university teaching, a conversational framework for the effective use of learning technologies. London: Routledge Farmer. Lave, J. and Wenger, E. 1991. Situated Learning: Legitimate peripheral learning. Cambridge: Cambridge University Press. Littlejohn, A. and Peacock, S. 2003. “From Pioneers to Partners: The Changing Voices of Staff Developers”. In J. Seale (Ed.). Learning technologies in transition. From Individual Enthusiasm to Institutional Implementation. Lisse, The Netherlands: Swets and Zeitlinger. Littlejohn, A., Cook, J., Campbell, L., Sclater, N., & Davis, H. (2007). Managing educational resources. In G. Conole & M. Oliver (Eds. ), Contemporary Perspectives in E-learning Research (Open & Flexible Learning) (1st ed.). Routledge. May, T. 2001. Social research. Issues, methods and process. Buckingham: Open University Press. McNaught, C., & Kennedy, P. (2000). Staff Development at RMIT: Bottom-Up Work Serviced by Top-Down Investment and Policy. Association for Learning Technology Journal, 8(1), 4-18. Mishra, P. and Koehler, M.J. 2006. “Technological Pedagogical Content Knowledge: A Framework for Teacher Knowledge”. Teachers College Record, Vol. 108, No. 6, pp. 1017-1054. Morrow, W.E. 2007. Learning to teach in South Africa. Cape Town: HSRC Press. Neiss, M.L. 2005. Preparing teachers to tach science and mathematics with technology: Developing a technology pedagogical content knowledge. Teaching and Teacher Education, Vol. 21, No. 5. pp 509-523. Oliver, M. 2002. “What do Learning Technologists do?”. Innovations in Education and Teaching International, Vol. 39, No 4, pp. 245-252. Oliver, M. 2003. “Looking Backwards, Looking Forwards: an Overview, Some Conclusions and an Agenda”. In J. Seale (Ed.). Learning technology in transition: From Individual Enthusiasm to Institutional Implementation. Lisse, The Netherlands: Swets and Zeitlinger. Postgraduate Diploma in Higher Education Course Guide. 2006. Academic Development Centre, Rhodes University. Quinn, L. 2003. “A theoretical framework for professional development in a South African university”. International Journal for Academic Development, Vol. 8, No. 1-2, pp. 61-75. Quinn, L. 2006. A social realist account of the emergence of a formal academic staff development programme at a South African university. A thesis submitted in fulfilment of the requirements for the degree of Doctor of Philosophy, Rhodes University, South Africa. Quinn, L. and Vorster, J. 2004. “Transforming teachers' conceptions of teaching and learning in a postgraduate certificate in higher education and training course”. South African Journal of Higher Education, Vol. 18, No. 1, pp. 364-381. Salmon, G. (2005). Flying not flapping: a strategic framework for elearning and pedagogical innovation in higher education institutions. ALT-J, 13(3), 201-218. doi: 10.1080/09687760500376439. Shephard, K. 2004. “The Role of Educational Developers in the Expansion of Educational Technology”. International Journal for Academic Development, Vol. 9, No. 1, pp. 67-83. Shulman, L. S. 1986. “Those who understand: knowledge growth in teaching”. Educational Researcher, Vol. 15, No. 2, pp. 4-14. Smith, J., & Oliver, M. (2000). Academic development: A framework for embedding learning technology. International Journal for Academic Development, 5(2), 129-137. Thorpe, M. (2002). From independent learning to collaborative learning: new communities of practice in open, distance and distributed learning, in Lea, M. R., & Nicoll, K. (Eds.). (2002). Distributed Learning: Social and Cultural Approaches to Practice (p. 131-51). Routledge/Falmer. Toohey, S. 1999. Designing courses for higher education. Philadelphia, Pa.: Open University Press. Unwin, A. 2007. “The professionalism of the higher education teacher: what’s ICT got to do with it?” Teaching in Higher Education, Vol. 12, No. 3, pp. 295-308. Wenger, E. 1998. Communities of practice: learning, meaning and identity. Cambridge: Cambridge University Press. Zhao, Y. (Ed.). 2003. What teachers should know about technology: Perspectives and practices. Greenwich, CT: Information Age.